I can't believe it's already been nearly three years since a small, curious spot called Niu Kitchen opened in downtown Miami, on a nondescript block across from Miami-Dade College. 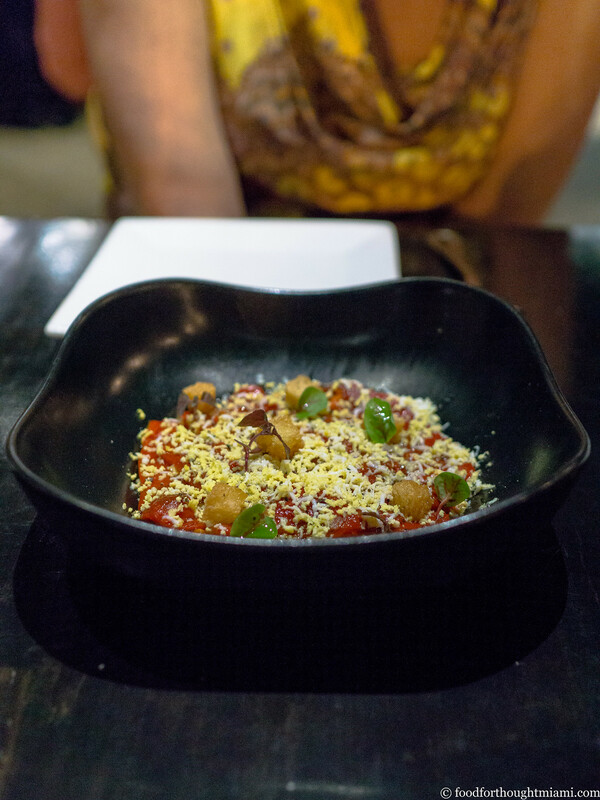 Despite its diminutive size, Niu manages to turn out Catalan-inspired food that is more creative, and more delicious, than many local restaurants with much bigger spaces and budgets. Now, the team of chef Deme Lomas and manager Karina Iglesias has doubled down, opening Arson just a few doors down. 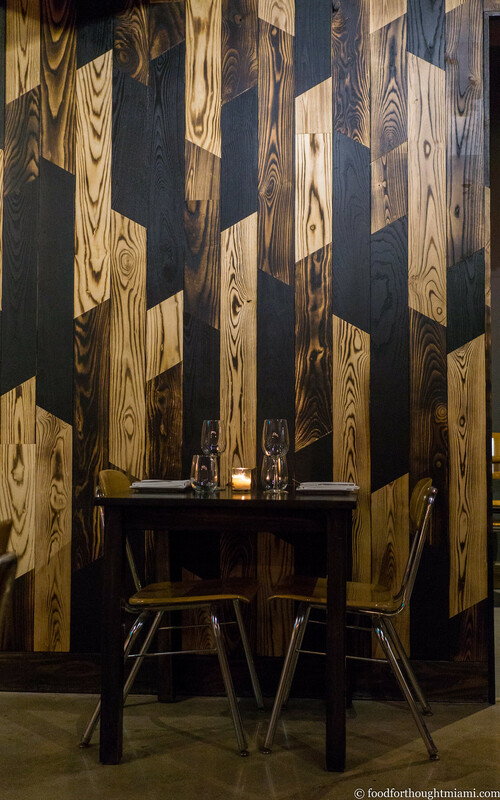 The roomier space may be twice the size of Niu, and as the name suggests, the focus is fire: pretty much every dish is touched by flame or smoke, mostly generated by the Josper, a Spanish-made, charcoal-fired oven / grill rig that is fast becoming many chefs' favorite new plaything. And while Niu remains more or less faithful to the Catalan theme, Arson is unbounded by genre: they'll set fire to anything. (You can see all my pictures in this Arson - Miami flickr set). The menu right now is pretty short and tight: four appetizer-sized dishes, four ocean-based proteins, four land-based proteins, rounded out by a few more items listed on a blackboard as daily specials. Prices tend to cluster around the $20 mark, and portion sizes run small, so that you might consider splitting an extra item among two people if you show up with a healthy appetite. We started with a couple of the smaller dishes (Arson is a "dishes are meant for sharing and come out as they're ready" kind of place; for our meal, apps came out before more substantial dishes, though not necessarily at the same time). Roasted red peppers, served at room temperature, were tender, sweet, and a little bit smoky, blanketed with garlic oil, grated hard boiled egg, and crunchy migas. I liked this a lot. 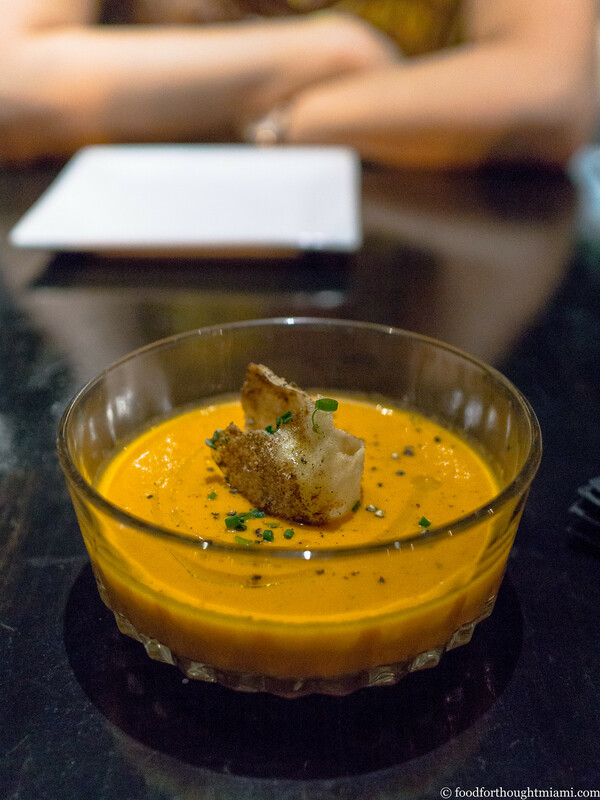 Another cool dish, anticipating summer: a chilled roasted vegetable soup, thick and creamy like a salmorejo, garnished with a crispy rice cracker bearing a payload of cinnamon and curry powder. Shatter the cracker and the warm spices perfume the bowl. 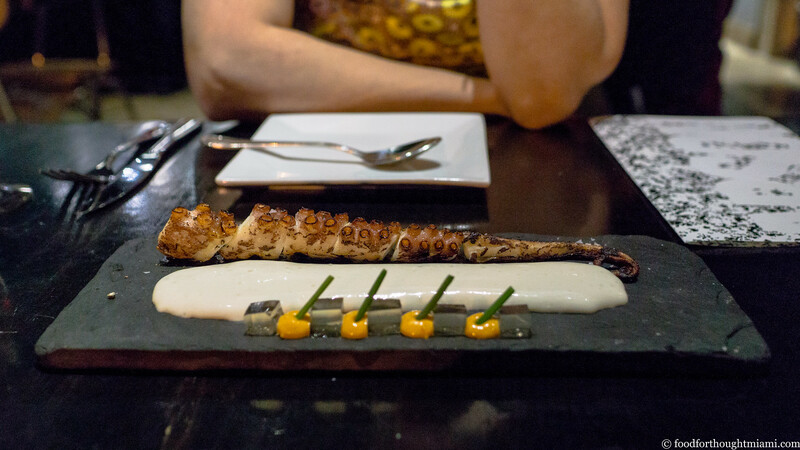 Spanish octopus looks like something from mid-aughts El Bulli, and tastes a bit like it too: a fat tentacle burnished on the grill, a broad stripe of frothy star anise infused cream, transparent cubes of tomato gelatin, dots of spicy (pimentón?) aioli. The octopus happens to be grilled just right, and the unusual accompaniments somehow work together. 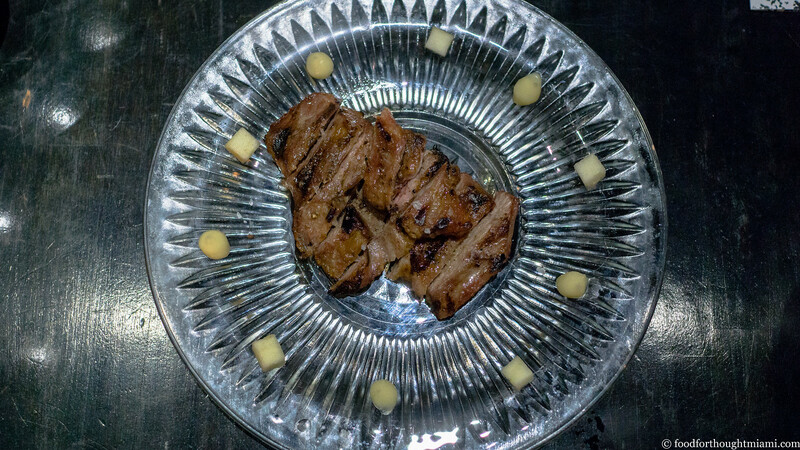 We order a couple of grilled meats from the chalkboard: the Spanish rabbit, and the secreto de iberico (there's also a whole fish, a duck, and a couple steaks, in addition to what's on the printed menu). The cut of rabbit is from the plump leg, which I've usually seen braised or confited, and there's a reason: this is a tight, muscular piece of meat, and slow cooking in liquid or fat lets it slacken and relax. Here, it's flavorful and juicy – and won't be mistaken for chicken – but still somewhat tough. The secreto, on the other hand, is pure joy. This "butcher's secret" cut eats like a skirt steak of pork, with a rippled, chewy but still giving texture and deep, intense flavor. It would be perfect as is – just grilled and assertively salted – but Deme adds little buttons of pungent garlic confit and cubes of tart apple around the edges of the plate. As we're almost finishing, Karina comes over from Niu and spots us (full disclosure: we spent lots of time at the counter at Red Light with Karina stalling for time, entertaining our kids, and plying us with beers as Kris Wessel sweated away in the kitchen), and sends over one more dish. 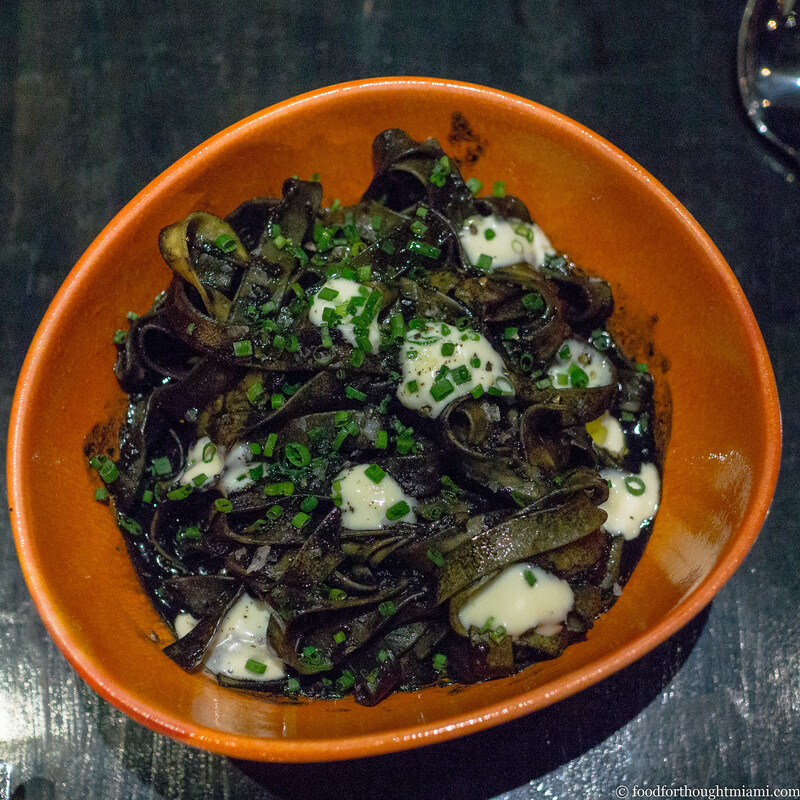 It's a pasta: tagliatelle dyed black with squid ink, studded with briny nubbins of grilled cuttlefish, awash in a tomato sofrito, and dotted with creamy aioli. It's excellent. 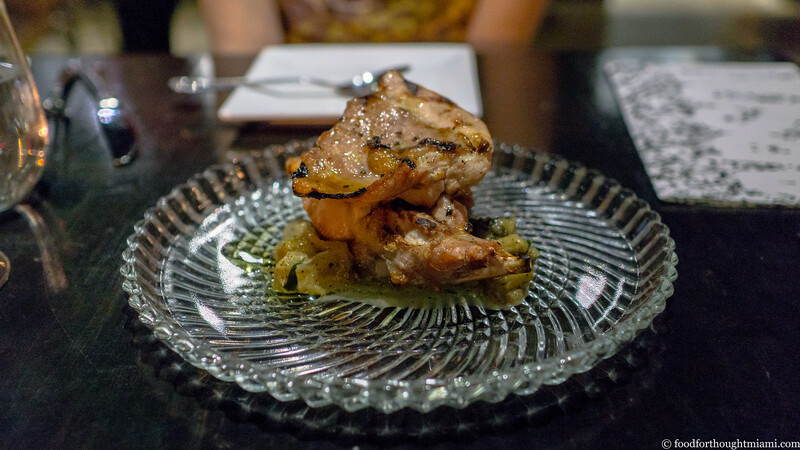 It also fills the spot that might otherwise have been occupied by one of a few desserts that are available, which also make some use of the Josper's flames. Like its sibling Niu Kitchen, Arson is a quirky place, and the short, simple menu can make it a bit of a challenge to cobble together a meal. But it's interesting, intriguing stuff, most of it quite delicious, and it's great to see something new from the Niu crew.